A deliciously different way to taco. Tangy grilled chicken, sweet Asian chile sauce and dumpling sauce stuffed into a crispy wonton shells and topped with a crunchy slaw and cilantro mix. Chipotle lime chicken, salsa verde & pico. Crisp outside with melty Mozzarella inside, this favorite is served with marinara sauce. 6 oz. sirloin with a half rack of baby back ribs served with steamed broccoli, garlic mashed potatoes, signature coleslaw and onion tanglers. 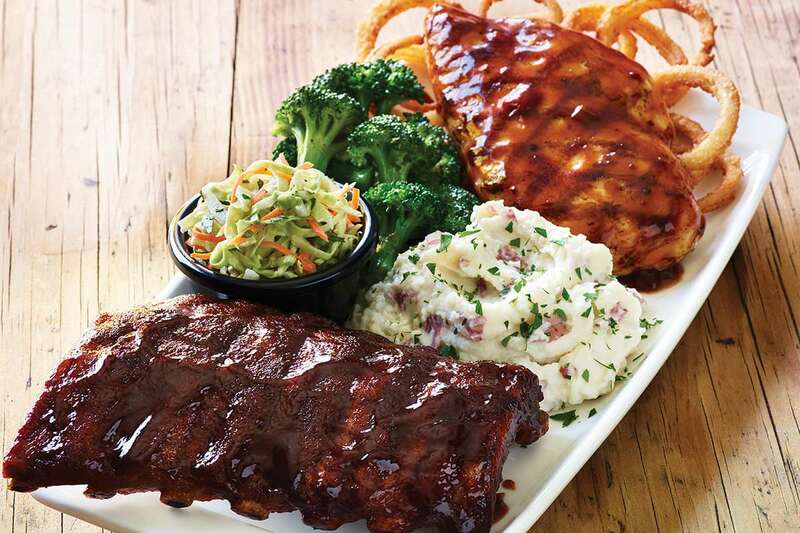 Half rack baby back ribs and grilled chicken breast with Fireball® Whisky-infused sauce served with steamed broccoli, garlic mashed potatoes, signature coleslaw and onion tanglers. Slow cooked to fall-off-the-bone tenderness. Big flavor from New Orleans. USDA choice top sirloin steak jazzled up with cajun spices and garlic butter served sizzling on a cast iron platter with sauteed mushrooms and onions. Served with crispy red potatoes. 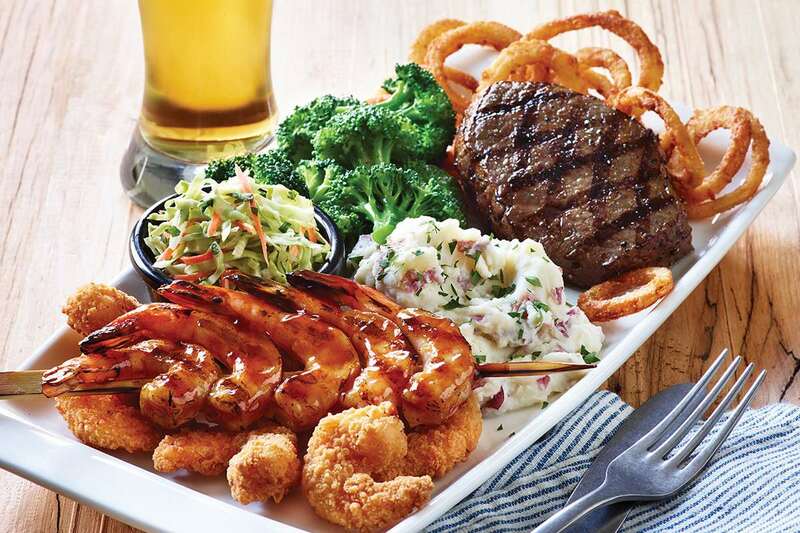 Let the good times roll w/ cajun seasoned chicken and blackened shrimp in garlic butter served sizzling on a cast iron platter with sauteed mushrooms and onions. Served with crispy red potatoes. Full platter of crispy chicken tenders. 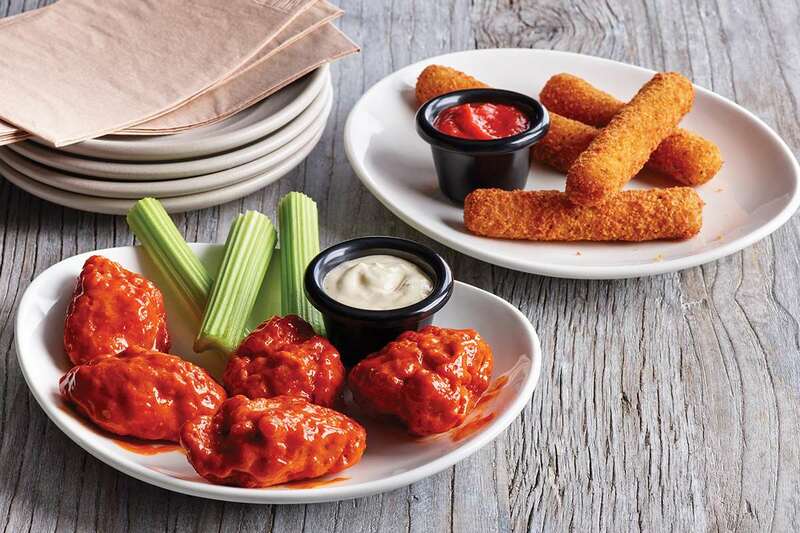 Served with fries, slaw and choice of dipping sauce. Crispy breaded chicken tenders are a grill and bar classic. 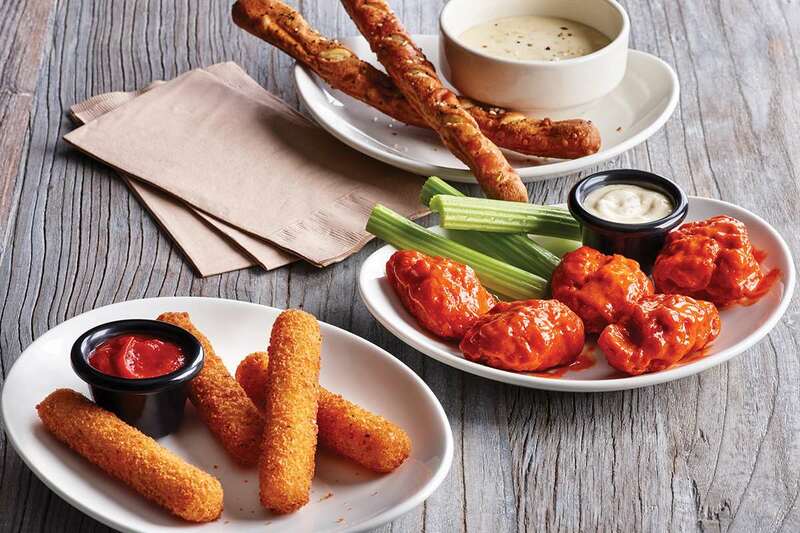 Served with choice of dipping sauce and fries. Cedar seasoned, maple mustard glaze and steamed spinach. Served with 2 sides. Stir-fry shrimp and veggies are tossed in a sweet and spicy dumpling sauce, served over a bed rice and topped with wonton strips. Crispy battered shrimp are fried golden brown. Served with cocktail sauce, tarter sauce, slaw and fries. Penne pasta and tender, thinly sliced prime rib tossed in a hearty parmesan cream mushroom sauce with sundried tomato. Finished with parmesan cheese and a sprinkle of parsley. Served with Applebee's new delicious signature breadstick, brushed with garlic and parsley butter. Juicy grilled chicken is served warm on a bed of fettuccine pasta tossed with broccoli and rich Alfredo sauce and topped with Parmesan cheese. Blackened Shrimp is served warm on a bed of fettuccine pasta tossed with broccoli and rich Alfredo sauce and topped with fresh Parmesan cheese. An Italian classic with crispy chicken covered in warm marinara and topped with melted Mozzarella and Parmesan cheeses. Served on fettuccine pasta and topped with fresh parsley. Asiago, Parmesan and white cheddar are mixed with corkscrew cavatappi pasta in a rich Parmesan cream sauce then topped with grilled chicken, bruschetta tomatoes and basil. Grilled chicken topped w/ chimichurri, served w/ mixed greens, black bean corn salsa, a blend of cheddar cheese, tortilla chips & house made salsa. A hearty salad with juicy grilled chicken on a bed of fresh greens topped with a blend of Cheddar cheeses, grape tomatoes and a hard-boiled egg. Served with honey Dijon mustard dressing. Grilled USDA choice top sirloin topped with chimichurri. Served with mixed greens, black bean corn salsa, blend of cheddar cheeses, tortilla strips and house-made cilantro ranch. Grilled chicken tops a bed of Asian greens, rice, noodles, & almonds, tossed in our oriental vinaigrette. Crisp romaine tossed in garlic Caesar dressing topped w/ grilled chicken, croutons and shaved Parmesan. Grilled chicken breast, bacon, cheddar cheese, lettuce, tomato, onion, pickle, finished w/ bbq bacon ranch, served w/ fries. Bursting with big texas flavor, shredded beef brisket, spicy texas BBQ, blend of cheddar cheeses and pico are topped with crispy onions and drizzled with our Mexi-ranch dressing and cilantro. Served with our signature coleslaw. Juicy chipotle chicken with crisp lettuce, blend of Cheddar cheeses and house-made pico wrapped in a tortilla with our mexi-ranch dipping sauce. Savor the rich flavor in this tasty original. Caramelized onion and bacon seared into an all-beef patty piled with pepper Jack cheese, crispy onions, bacon and fire ball whisky steak sauce on a broiche bun. All-beef patty with bacon seared -in and topped with Cheddar, tangy BBQ bacon ranch and more crispy bacon slices on Brioche bun. Part burger, part quesadilla, all taste. This original burger creation comes piled high with Jack cheese, our signature Mexi-ranch sauce, crsipy bacon, fresh pico and shredded lettuce in a crisp, warm cheddar quesadilla. A mini version of the classic with hot fudge, vanilla ice cream, whipped cream and a cherry on top.